The HSE-152A/SK microphone is comfortable to wear, provides perfectly stable positioning, and the high-quality back electret cartridge ensures a high-quality audio reproduction of vocals. The HSE-152A/SK headset has cardioid characteristic. The flexible connection cable features a plug with locking ring, which ensures a safe connection to the corresponding adapter. 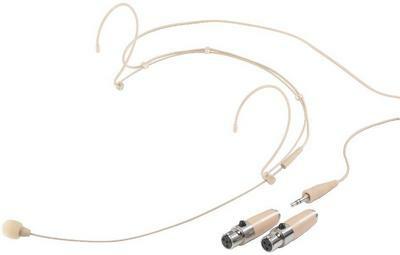 The headset is supplied with a 3-Pole (NTA-3A) and 4-Pole (NTA-4SH) Mini XLR adaptors. (Other adaptors are also available). Replacement cable HSE-70C is a available, 2.5mm jack plug to head band.